subroutine Trace – If successful, give the Runner 1 tag. If your trace strength is 5 or greater, give the Runner 1 tag. Virgo promised love, but offered only jealousy. Virgo is an extremely nice tagging option in an NBN Tag deck. An investment of 7 will guarantee the tag, though in Making News, that investment drops to 5, making that identity a better candidate for this ICE. If the runner happens to run into it while broke, a small investment on the Corp side can turn this encounter into a double tag. The 5 Strength is incredibly nice, meaning Virgo remains a great taxing option even after it's rezzed, in the same vain as Grim. The best part is, in Making News, the trace is always a threat. Even if the Corp is sitting on 1 credit, the Runner does not want to run through the trace, since a tag is guaranteed with Trace 5. The biggest question, does this overtake Data Raven as far as tagging Sentries go? The answer: They're both entirely different and serve different purposes (surprisingly enough). For an aggressive tagging system, Virgo does the job much better than Data Raven, the reason being that the Runner can always opt to jack out of Data Raven and wait until they have the breaker/money to run it again as safely as possible. If they're surprised with a Virgo, they'll need to suffer at least one (if not two) tags before the run is over. Data Raven, however, serves as a great run deterrent. If you want the runner to jack out or stop running for a short bit, Data Raven will keep them out. It also doesn't need to rely on a credit investment or a subroutine in order to tag. Data Raven tags on the encounter, meaning even if the Runner has that sentry breaker out, they're not getting through without taking a tag. Double Data Ravens on a server can be extremely punishing. Also, getting a Power Counter on Data Raven gives the Corp a ridiculous amount of power. Overall, Virgo is a very neat tagging option that sets itself apart from Data Raven and manages to offer an alternative tagging system. 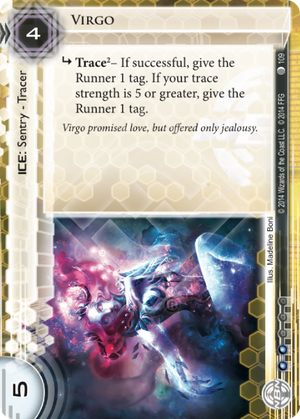 Virgo is a very solid card, but it may be worthwhile to notice that there are no "guaranteed" tags here: the runner can break the subroutine, avoiding the trace and the tags altogether. If you can live/deal with Bad Publicity, Muckraker could be a better option for feeding tags than Virgo. It's in Mimic range, but 4 subroutines are taxing nonetheless.